What does two years of blogging get you? I guess that all depends on what you’re looking at. Some might look at numbers, and I did out of curiosity. I was going to post them here but thought that a bit mundane. Looking at views and then thinking how many likes you get on the same posts can be very telling. I’ve never been fooled by it. I know 50 likes doesn’t mean 50 views. It means about 30 views and the other 20 are mixed between people just clicking like in the WP Reader or on my Home Page. It doesn’t bother me either way. I stopped caring about likes a long time ago. I just share what I have and go on my merry little way. Again, what does two years of blogging get you? A network of people for my Book Review site that I never would have thought of if not for this blog. A published book that is receiving great reviews. (And you can get for free by signing up for my newsletter. And finally I got a better version of me. Before beginning this blog I was in a bad place in regards to health and mind. Now I’m still in a bad place health wise, but my mind is not so depressed as it was before. I realize I can do something on my own schedule which is whenever I have the energy. You may have noticed I apparently don’t have that much energy lately. I want to thank all of you that are my friends. You know who you are. I thank all those who visit my blog each week and enjoy what they find here. ← Two years in the blogging and here’s something I have to show for it. Aw lovely Ron! 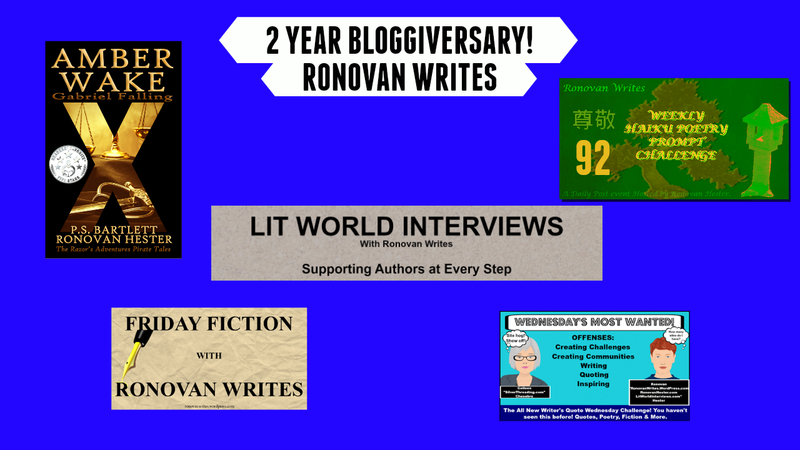 Congrats on your 2 year Blogiversary! Congratulations!Ronovan. May you stay forever blessed and wishing you very many years of blogging! Is it only 2 years? Mine passed in February, yet I thought you’d been blogging longer than me. You can always tell the bloggers who put in the time and hard work. You’re certainly one of them. Friends and a productive mind – that’s well worth writing for! thank you for being part of the community and congrats on two years. Gotta love the blog life. As long as you keep it real and keep in mind to enjoy it. Congrats Ron! Here’s to the next two years! This is a real like. I only like what I read and what I like.